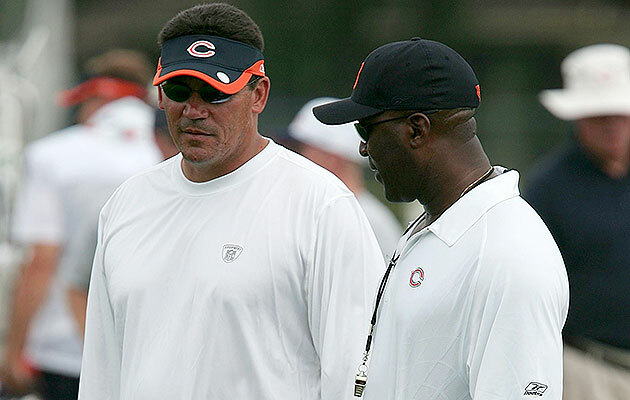 “Lovie stabbed him in the back.” How Ron Rivera had to restart his climb up the coaching ladder after being fired by the Bears. SAN JOSE — Among the credentialed clowns and oddballs at the Super Bowl’s “Opening Night” for media was a gentleman carrying a Panthers-themed lucha libre wrestling mask. After showing it to Ron Rivera, who paid him a nice compliment, the fellow asked Carolina’s head coach to put the mask on. A few minutes later, Rivera pulled on a different mask, of sorts, when asked by SI to recount the most disappointing chapter of his 18-year coaching career. Nine years earlier, he’d been the defensive coordinator of a Bears club that lost to Peyton Manning and the Colts in Super Bowl XLI. Rivera was a hot property, having spoken with at least eight teams over the previous two seasons about their head coaching vacancies. Instead of a bump up, he was pushed overboard in Chicago by head coach Lovie Smith, who announced on Feb. 20, 2007, that Rivera’s contract would not be renewed. Forced to scramble for work, Rivera caught on with the Chargers as their linebackers coach, taking a cut in pay and prestige. Recalling that time, Rivera performs a kind of alchemy, recasting his disappointment and demotion into adventure and opportunity. Rivera has been so relentlessly gracious, so determined never to exit the high road when discussing his painful, ungainly departure from the city that was his home for 16 years, that it’s easy to forget what a raw deal he got. “He left on not-so-good terms,” confirms an ex-Bear who is a close friend of Rivera’s. Dan Hampton puts a finer point on it, as is his wont: “Lovie stabbed him in the back,” says the former Bears defensive tackle and Hall of Famer. Smith is between gigs at the moment, having been fired last month by the Buccaneers. He did not respond to interview requests directed to his agent, who also happens to be his son, Matthew Smith. But Lovie had his reasons to want Rivera gone. Assembling his staff, after being hired by the Bears in 2004, he coveted Rod Marinelli as his defensive coordinator, but the Bucs wouldn’t let Marinelli out of his deal. Smith settled instead on Rivera, who, it has been speculated, was thrust on him by then GM Jerry Angelo. They were not necessarily aligned, philosophically. Smith, who’d coached linebackers for Tony Dungy in Tampa Bay from 1996 to 2000, was a proponent of his mentor’s Tampa-2. Rivera preferred a more balls-out, attacking style. He’d played for Buddy Ryan, father of the famed 46 defense, then served a second apprenticeship as Eagles linebackers coach from 1999 to ’03, soaking up knowledge from the late, legendary Jim Johnson, a DC known for his ultra-aggressive, blitz-happy schemes. Then came the Super Bowl. The Colts hung 29 points on the Bears, beating them by 12. Indy’s first touchdown, in particular, stuck in Smith’s craw: a 53-yard bomb from Manning to Reggie Wayne that was the result of a hideously blown coverage. Never mind that those Bears, quarterbacked by the immortal Rex Grossman, wouldn’t have gotten near the title game were it not for Rivera’s stifling defense. There was a whiff of scapegoating when Smith announced to a stunned press corps 15 days after the Super Bowl that Rivera would not be back. It was nothing personal, Smith said. He’d just decided to go in a different direction. Rivera wasn’t being fired. It was just that his contract wouldn’t be renewed. Beyond the semantics is the reality: Rivera wanted to come back. Smith didn’t want him back. Speculation flew that Smith had executed a Machiavellian power play. Coming off the Super Bowl, his influence with the McCaskey family at a high-water mark, he’d banished a perceived threat, a talented young coach who was popular with both players and fans, and whose Bears bloodlines reached back to that historic ’85 team. There was another reason this marriage could not be saved. Just as Ray Liotta’s character, Henry Hill, could never be a “made guy” in Goodfellas because he had Irish blood, Rivera could never enter Smith’s inner circle. He was never one of Lovie’s guys. More so than many NFL coaches, Smith puts a premium on loyalty. In hiring assistants and signing players, he has at times appeared to value the strength of his bond with the candidate above that person’s actual acumen or talent. Recent examples could be found in the Buccaneers’ 2015 secondary, which was, incidentally, a mess. Gil Byrd, a longtime friend of Smith’s, coached cornerbacks. In charge of the slot cornerbacks was Larry Marmie, an even older friend, who according to the Tampa Tribune is “an adoptive father to Lovie” who “was responsible for Smith getting jobs as an assistant at Tulsa, Wisconsin, Arizona State and Tennessee.” Coaching the safeties: Smith’s son, Mikal. Back in ’07, Rivera was jettisoned to make room for one Bob Babich, whose thin NFL résumé was trumped by his long association with Smith. Alas, Babich lacked the right stuff. In his first year replacing Rivera, the Bears plunged from No. 5 to No. 28 in points allowed. After his second season, Babich was relieved of his play-calling duties by Smith. Smith was forced to repeat that embarrassing step following Tampa’s 2014 season, when he removed play-calling responsibilities from the portfolio of Bucs DC Leslie Frazier. Dialing up his own blitzes this season was not enough to save Smith’s job. The four-win improvement the Bucs had shown in finishing 6–10 was not enough to placate the Glazer family, who dropped the axe on Jan. 6—a day after the Jaguars whacked defensive coordinator Bob Babich, and not quite nine years after Smith sent Rivera packing. He spoke with a complete absence of bitterness, with the peace of mind of one who has proved his abilities beyond a shadow of a doubt, with the graciousness of one who was wronged, and has risen above.